The Dartmouth Lower Ferry at its Kingswear slip. The Dartmouth Lower Ferry crossing towards Dartmouth (in background). The Dartmouth Lower Ferry is a vehicular and passenger ferry which crosses the River Dart in the English county of Devon. It is one of three ferries that cross the tidal river from Dartmouth to Kingswear, the others being the Higher Ferry and the Passenger Ferry. The 630-mile (1,010 km) long South West Coast Path crosses the Dart on either the Lower or Passenger ferries. 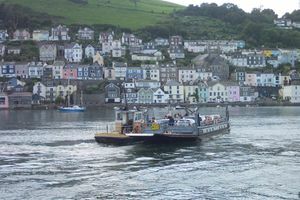 Unlike the Higher Ferry, which operates somewhat to the north of the centres of Dartmouth and Kingswear, the Lower Ferry operates from slips directly in the centre of both places. This is more convenient for local traffic, but means the traffic must negotiate the narrow streets of Kingswear village. The ferry is owned and operated by the South Hams District Council. It is operated by unpowered ferry pontoons, carrying up to 8 cars each. Each ferry pontoon is pushed and pulled by a tug boat and, when traffic demands, two such ferry/tug combinations are used in service at the same time. There are records of a "Kingswear Ferry" as early as 1365. By the 18th century another was sailing from Hoodown on the Kingswear side, upstream from Waterhead Creek, which had an easier approach than the steep slipway in the village square. The Dartmouth and Torbay Railway was authorised by its 1857 Act of Parliament to establish a steam ferry across the Dart from its station and agreed to purchase the ferries, although the Hoodown Ferry was discontinued in 1864 after the opening of the railway. The remaining Kingswear Ferry was leased out by the railway to a succession of local operators. In addition to the rowing boat that operated from Kingswear, a "horse boat" was operated that could convey a horse and cart. A steam ferry, the supplemented the rowed ferry in April 1867 and this could tow the horse boat when required. A new steam ferry, the Forester was brought into use in 1878. The rowing boat finally ceased operation in 1915 when the Relief was introduced. In the 1920s the railway sold the ferry rights to Dartmouth Corporation. ↑ "Dartmouth Lower Ferry". South Hams District Council. http://www.southhams.gov.uk/sp-dartmouthlowerferry.htm. Retrieved 2008-09-17. ↑ Potts, C R (1998). The Newton Abbot to Kingswear Railway (1844 - 1988). Oxford: Oakwood Press. ISBN 0-853613-87-7. 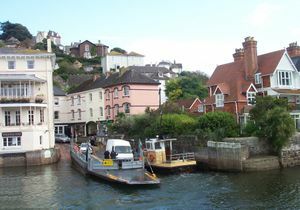 Shot on 5 August 2010, and showing the Lower Ferry leaving Kingswear to make way for the Kingswear bound ferry carryimg only an emergency ambulance with blue flashing lights. The ferry is tracked to the Dartmouth slip. This page was last edited on 5 August 2010, at 20:23.